apparently the Let’s Bring On Fall party worked, because the insanely hot temperatures finally dropped in nashville this past weekend. as excited as i am for cooler weather, colorful leaves, comforting soups/stews, + seasonal produce, i wanted to get in one more summery dessert before officially welcoming fall. 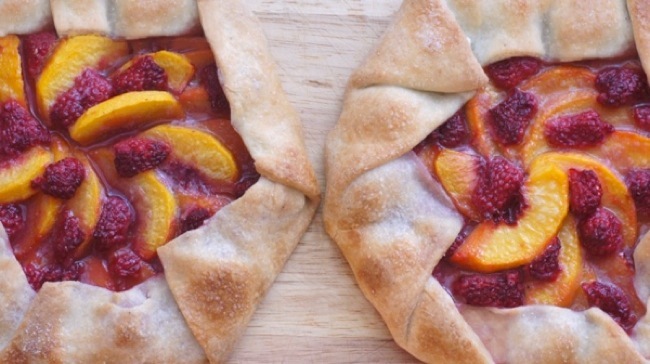 as peaches are my favorite fruit + still in season, i knew that i wanted to try making a delicious-looking peach + raspberry galette that i had bookmarked months ago. i was a bit nervous, as i had never made a galette before + they always look so perfect + professional. however, now that i’ve made one, i can say that galettes are shockingly easy to make. who knew?! i was so pleased with both the amazing flavors + the lovely colorful + rustic appearance. the fruits lend a sweet + slightly tart flavor to the filling, while the crust is decadently buttery + flaky. i also love that i can use this recipe all year ’round, using the same galette dough + changing the filling depending on what’s in season. make the dough: mix the sour cream + water together in a small bowl + set aside. put the flour, cornmeal, sugar, + salt in a large bowl + mix with a fork. drop butter pieces into bowl + coat with flour. work the butter into the flour with a pastry blender until the butter pieces resemble crumbs to small peas. sprinkle the cold sour cream mixture over the dough, 1 tbsp at a time, tossing with fork to distribute. when done, the dough should be moist enough to hold together when pressed. ddd more water if necessary. gather together into 2 discs, cover with plastic wrap + refrigerate for at least 2 hours, or up to 2 days. make the galette: position rack in lower third of oven + preheat to 400 degrees. line a baking sheet (or two, if you are making both galettes) with parchment paper or silpats. put dough on lightly floured surface + roll out to an 11-inch circle at 1/8th inch thickness. add flour as necessary to prevent stickage. roll the dough around your rolling pin + transfer to the parchment paper/silpat. spread half the fruit over each dough round, leaving a 2-3” border of dough. sprinkle 1 tbsp of sugar over each pile of fruit + scatter thin slices of the butter on top. fold the border of the dough up over the filling – it will pleat as you fold. brush the crust lightly with water + sprinkle the turbino sugar on top. bake for 35 – 40 minutes or until pastry is golden + crisp. transfer to a cooling rack + let rest for 10 minutes. serve warm or at room temperature. best eaten the day it is made. How lovely Amy! I need to have a Fall party too…I’d love some Fall weather in SC! This is GORGEOUS, Amy! I love peaches and raspberries, and both are on sale this week. I may just have our game-watching dessert for Sunday’s Texans game!! that makes me feel fabulous, wendy. hope you try it out + love it. we’ll be doing lots of football-watching this sunday (+ every sunday for the next few months) so there will be lots of group-friendly snacks + sweets on the blog! Absolute perfect combo for fall. I can’t wait to see what you do with apple season! serving this warm with vanilla ice cream is definitely the way to go! now that i know how easy galettes are, i can’t wait to try other versions using fall + winter produce. it might be fun to play around with some savory versions, too. yay for galettes! Amy- These are beautiful and sound delicious! I’ll have to give them a go soon! Yum! I think I’ll try this recipe with peaches and blueberries. Looks like something that would be great after a big meal. Just the right size (I guess that depends on how big of a slice you get too). it would be wonderful with blueberries. i almost went with strawberries but changed my mind to raspberries at the last minute. really, the combination possibilities are endless! Girl, I would like to write about your blog on Thursday, when I promote some food blogs I like. Can I do that? Let me know! of course you can! i’m so flattered that you want to write about my lil ol’ blog. can’t wait to see it! This looks fabulous Amy! Love the peach and raspberry colors together! I just googled recipes for gluten-free galette dough, and several good ones popped up, so I’m definitely going to try this. Love your hot dog sugar cookie too-adorable! aren’t the colors just gorgeous? i’m so glad you were able to find a gluten-free galette dough recipe so you can try this — i can’t wait to hear how it turns out! Wow! These photos belong in a magazine! aww, thank you so much! aren’t the colors just too pretty for words? it made getting a good picture easy! Amy these are gorgeous! Perfect transition from Summer to Fall using peaches! thank you so much, elizabeth! i like that galettes transition between all seasons so easily – they’re a fab year-round dessert, so seasonal depending on what you put in there. love that! Absolutely beautiful! I’m definitely need to try making a galette soon. What a great flavor combo…i love peaches and raspberries! peaches + raspberries are one of my favorite combos, too. you’ve got to try making a galette soon – i know yours would turn out delicious + beautiful, as would your pictures! Amy this looks so delicious! I swear I have about 10 different cookbooks where I’ve tagged a galette…but I can’t ever bring myself to bite the bullet and make one. I think you’ve finally inspired me! MAYBE I’ll finally get around to making one soon…. I love that color combo! yum! thanks erin + lesley. they were definitely yum-worthy! This is absolutely gorgeous! The colors are amazing…and even a little fall-like! I haven’t tried making a galette, but you have inspired me. I think they look so beautiful and sophisticated. i’m so glad you’re inspired to give ’em a try — i think you’ll be surprised at how easy they are to make + how gorgeous they turn out. i know i was! Hi Amy! I came over from Marina’s site. You have beautiful site with lots of delicious food and not to mention gorgeous photos too! I’m your new follower. glad you found your way over here, nami + thank you so much for your kind words. off to check out your blog now! Not only do these sound delicious, they are beautiful as well. Amy, these look so pretty. Enjoying all your posts and getting myself caught up. thank you! aren’t they just lovely? i love the color combination of the peaches + the raspberries – such a beautiful combo! Previous post: hot dog sugar cookies – perfect for labor day cookouts!